The mountains near Baja California North – specifically La Bocana to Laguna Hanson. The Western Ghats that run along India's western coast. The Great Dividing Range of Eastern and South Eastern Australia which forces uplift of moist air originating from the ocean to the east. The mountains of New Zealand, which faces a prevailing westerly flow off the Tasman Sea. The mountainous western coastal regions of Tasmania which also face a prevailing westerly flow. The southern Andes, which faces a prevailing westerly flow off the Pacific Ocean. The Northwestern United States and Canada (Oregon, Washington, British Columbia, and Southern Alaska) see prevailing westerly flow off the northern Pacific Ocean. Places on the sea-facing side of coastal mountains see in excess of 140 inches (over 3.5 m) of precipitation per year. These locales are on the side of the mountains which are in the path of storm systems, and therefore receive the moisture which is effectively squeezed from the clouds. The ski country region of New York and Pennsylvania, particularly with lake effect snows. Transylvania County, North Carolina, which gets the most rainfall of anywhere in the Eastern U.S. (90 inches [2,300 mm]). The Appalachian Mountains in West Virginia (particularly the western facing slopes). The Eastern seaboard of Madagascar. Table Mountain, Cape Town, South Africa. The cold Atlantic air mass flows up over the north western face to 3,500 feet (1,100 m) above sea level and is met by the warm Indian Ocean air mass from the south eastern back side of the mountain forming the famous "Table Cloth". Oppland mountain area, Norway, orographic clouds meeting the mountains cause heavy rains. The Front Range Foothills of Northern Colorado – specifically just west of Boulder to Golden as storms pass by to the east. Winter storms can produce 5–6 feet (1.5–1.8 m) of snow. The highest precipitation amounts are found slightly upwind from the prevailing winds at the crests of mountain ranges, where they relieve and therefore the upward lifting is greatest. As the air descends the lee side of the mountain, it warms and dries, creating a rain shadow. On the lee side of the mountains, sometimes as little as 15 miles (25 km) away from high precipitation zones, annual precipitation can be as low as 8 inches (200 mm) per year. North East England is in the rain shadow of the Pennines, this combined with Britain's prevailing wind from the South West. This explains the significant differences between the rainfall in the North West and North East. The Judean Desert in the Land of Israel and the Dead Sea. Downslope winds occur on the leeward side of mountain barriers when a stable air mass is carried over the mountain by strong winds that increase in strength with height. Moisture is removed and latent heat released as the air mass is orographically lifted. As the air mass descends, it is compression heated. The warm foehn wind, locally known as the Chinook wind, Bergwind or Diablo wind or Nor'wester depending on the region, provide examples of this type of wind, and are driven in part by latent heat released by orographic-lifting-induced precipitation. A similar class of winds, the Sirocco, the Bora and Santa Ana winds, are examples where orographic lifting has limited effect since there is limited moisture to remove in the Saharan or other air masses; the Sirocco, Bora and Santa Ana are driven primarily by (adiabatic) compression heating. As air flows over mountain barriers, orographic lift can create a variety of cloud effects. Orographic fog is formed as the air rises up the slope and will often envelope the summit. When the air is humid, some of the moisture will fall on the windward slope and on the summit of the mountain. When there is a high wind, a banner cloud is formed downwind of the upper slopes of isolated, steep-sided mountains. This cloud is similar to the condensation observed off aircraft wings flying in humid conditions; it is created by the vortices and local uplifting in the air caused by the orographic lifting as the wind passes the mountain. 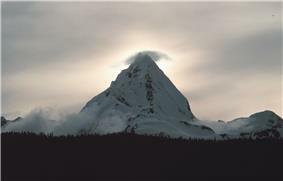 The most famous such cloud forms routinely in the lee of the Matterhorn. 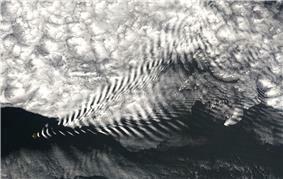 The leeward edge of an extensive mass of orographic clouds may be quite distinct. On the leeward side of the mountain, the air flowing downward is known as a foehn wind. Because some of the moisture that has condensed on the top of the mountain has precipitated, the foehn (or föhn) is drier, and the lower moisture content causes the descending air mass to warm up more than it had cooled down during ascent. A view of the Front Range of the Rockies capped by a föhn wall. The distinct cut-off line which forms along and parallel to the ridge line is sometimes known as a foehn wall (or föhn wall). This is because the edge appears stationary and it often appears to have an abrupt wall-like edge. A foehn wall is a common feature along the Front Range of the Colorado Rockies. A Rotor cloud is sometimes formed downwind and below the level of the ridge. It has the appearance of the ragged cumulus cloud type but it is caused by a turbulent horizontal vortex, i.e. the air is very rough. 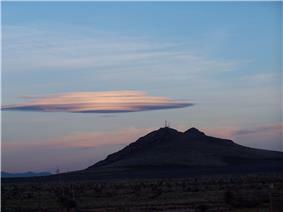 A lenticular cloud in New Mexico. Lenticular clouds are stationary lens-shaped clouds that are formed downwind of mountains by lee waves if the air mass is close to the dew point. They are normally aligned at right-angles to the wind direction and are formed at altitudes up to 12,000 metres (39,370 ft). A cap cloud is a special form of the lenticular cloud with a base low enough that it forms around and covers the peak, capping it. 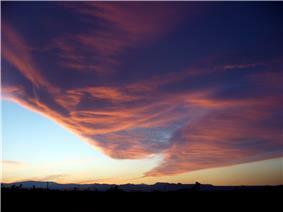 A chinook arch cloud is an extensive wave cloud. It has this special name in North America where it is associated with the Chinook wind. It forms above the mountain range, usually at the beginning of a chinook wind as a result of orographic lifting over the range. It appears when seen from downwind to form an arch over the mountain range. A layer of clear air separates it from the mountain. 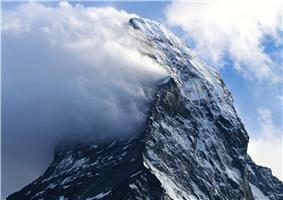 ^ Example of a banner cloud forming in the lee of the Matterhorn.